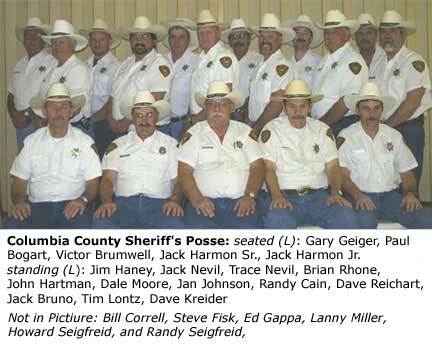 The Columbia County Sheriffs Posse is chartered by The Sheriff's Office. This unit is comprised of 30 volunteers that are accomplished horsemen. The Sheriffs Posse assists law enforcement in search and rescue operations which range from lost hunters to locating downed planes. Our skills even include the occasional cow round up. The Sheriffs Posse is committed to our county and conducts fundraising events the help support the Special Olympics and outstanding local young people. The Sheriffs Posse can be seen on patrol at the Bloomsburg Fair. The Sheriffs Posse has helped to reduce theft and provide added safety to the parking areas in the last several years. We are proud of the men who serve in this unit.